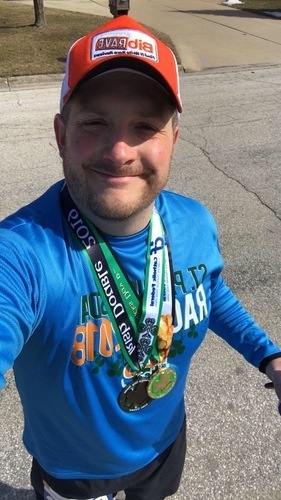 "2019 Double Irish Bay City St. Pat’s Races"
I ran the Irish-Double (8K & 5K) at the 45th Annual Bay City St. Patrick’s Day Races. Both races went by fast and race management was fantastic. I believe the total participant number was around 6,500 for both races. The medals and shirts were awesome, the road race was well maintained and organized. I will definitely be making this a yearly race! "A Half Marathon Below Zero!" "Great Pumpkin Race/Tough Pumpkin 5K"
Great Pumpkin Run 2018 was a great race with an amazing orchard and trails to run! 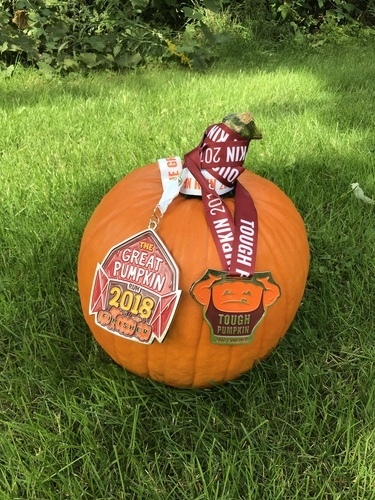 I ran the Tough Pumpkin option and carried a 16 pound pumpkin through the entire 5K! The tech shirts and optional winter hat are incredible quality! The race features a 5K that takes you through the orchard and into the woods. 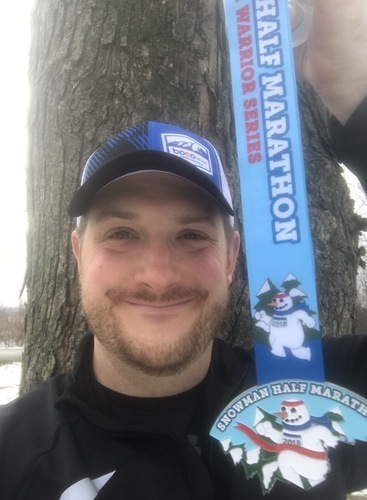 I had a great time and recommend this race. I will definitely be running it again next year! The medals are awesome (see photo)! 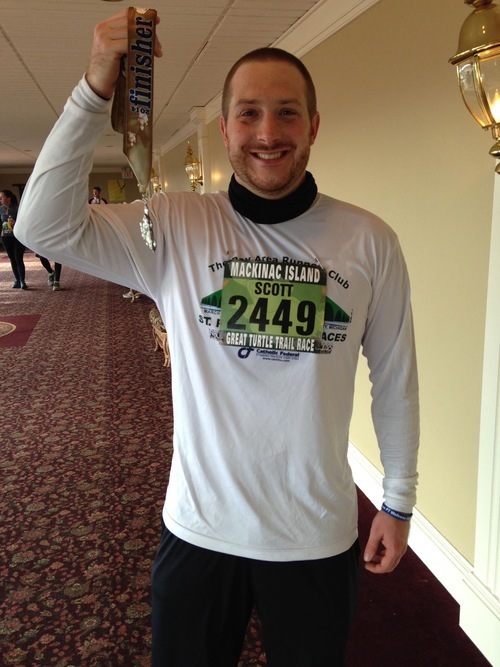 "Icy, muddy, cold Half Marathon "
The race started on paved roads by CMU’s SAC. The route then led to unpaved, dirt country roads for the majority of the race. The holes in the dirt roads, which had frozen solid, made for a beating in runners knees. 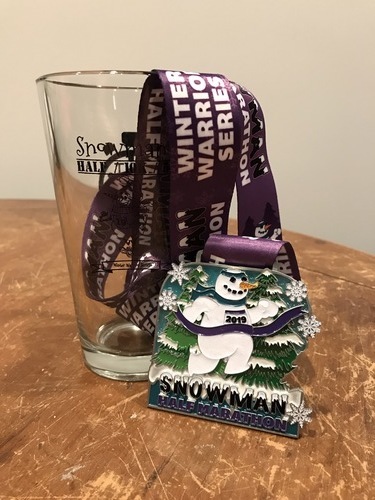 The open fields surrounding the majority of the race made for cold frigid winds, but the after party was fun and each runner was given a pint glass and winter hat. This year each half marathon finisher also received a finisher’s medal. The race is part of a three race series, so each of the half marathon medals fit together to form a larger medal. Although the race was tough, I am very glad that I ran it! It was a new experience taking on this distance in the winter! I finished the race in 2:22. A fun 5K race that takes you through the decorated neighborhoods of Auburn, starting and finishing in the Auburn Park. A quick, flat, road race with two hills for a little elevation at the start and finish of the race. It was a great cold, snowy, run. I finished 16th overall! And ran a 24:57, PR! The shirts were long-sleeve T-shirt’s and the medals were nice!